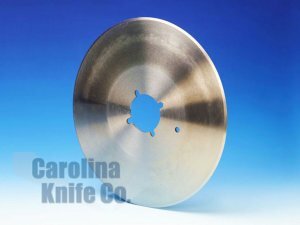 E & L Slitting Blades - Shop Our Collection Of Top And Bottom Slitter Blades | Carolina Knife Co.
E & L slitting blades are durable cutters designed to fit specific slitting units. Most commonly used to cut textiles, the are made of M2 high speed steel, they are hardened to 61-63 Rockwell C-scale. Rotary shear cutting uses two cutting surfaces typically referred to as TOP and BOTTOM blades. These rotary slitter knives spin in opposite directions allowing a sheet of material to pass smoothly through the blades, similar to a pair of scissors. Rotary shear slitting is used to cut a wide range of materials, and similarly there are a wide range of blade designs for both the top and bottom slitter blades. 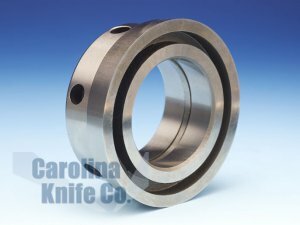 The blade material varies depending on the material to be cut, cutting application, budgeting, and other factors. 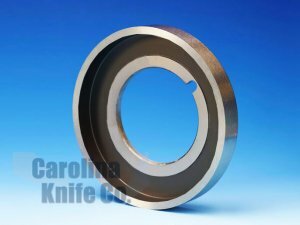 Carolina Knife supplies a wide range of rotary cutting blade designs in all popular materials. Erhardt & Leimer is a leader in creating the most advanced cutting technology systems that offer the highest cutting accuracy. 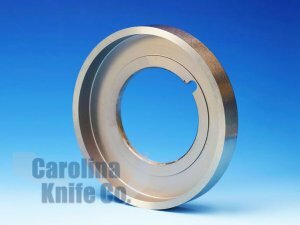 You can keep your cutting systems in tip-top shape by replacing dull and worn blades with E & L Slitter Knives from Carolina Knife Co.
Carolina Knife Co. manufacturers high-quality replacement slitter knives for E & L cutting systems. 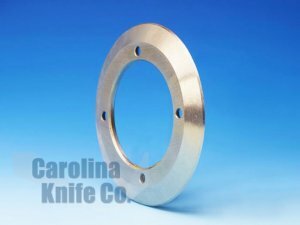 We manufacture this bottom circular knife using high-speed steel material. For assistance finding the blade right for your cutting machinery, contact us.